2018 - Almost 10 years since this was released, and it still hasn't left my record bag! 'From A Distance' is truly one of the finest dub house tracks ever produced. 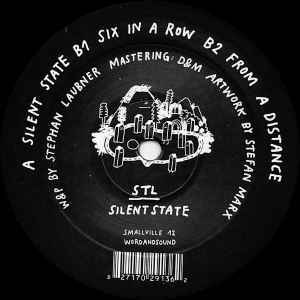 All three tracks are great, but Silent State is next level. One of the best records on Smallville that I have heard. It really stands out from the bunch. This is such a wonderful EP. All three tracks are killer but Silent State is next level. Both works as a tool and a stand alone track that never bores. Essential! STL seems nowadays to be one of the most worthy inheritors of the Maurizio legacy. His depth of sound and consensus of all the details and layers of his music make him not only comparable to the likes of basic channel but also a true descendant taking the sound deeper and further. this is the future of the dub-techno sound. all i can say is "thank you" for all the people involved in putting out a future classic release.